Whenever Ubuntu boots up, a dialogue pops up asking me to unlock my default keyring. Is there some way this can unlock automatically through PAM or some other magical way? Press ok, read the security warning, think about it and if you still want to get rid of this dialog, choose "use unsafe storage". Again, as the message says: This will expose all your passwords (e.g. email passwords) that you chose to save in the default keyring to anyone using your computer or having access to your files and is therefore not recommended. 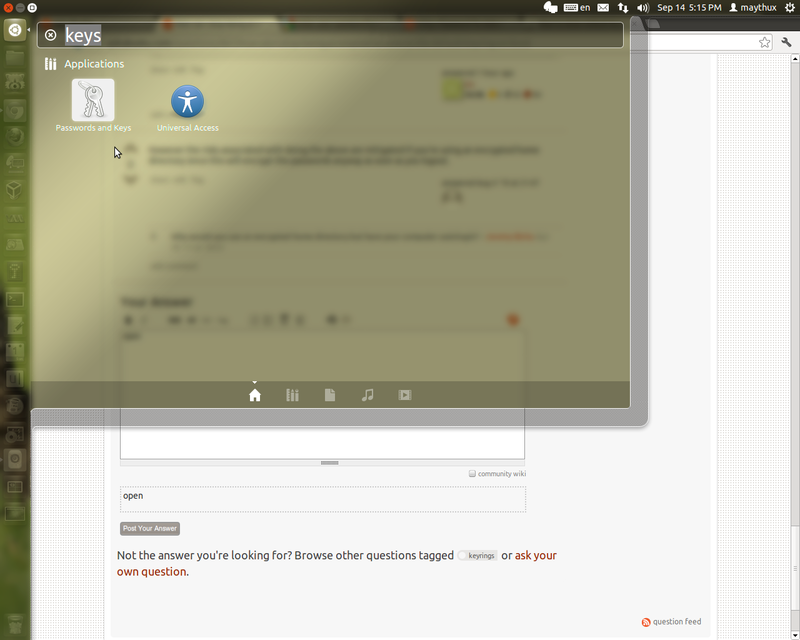 In the default Unity session, you can start the application by clicking on the Ubuntu logo in the top left corner, then typing Password, and selecting Password and Encryption Keys from the search result. 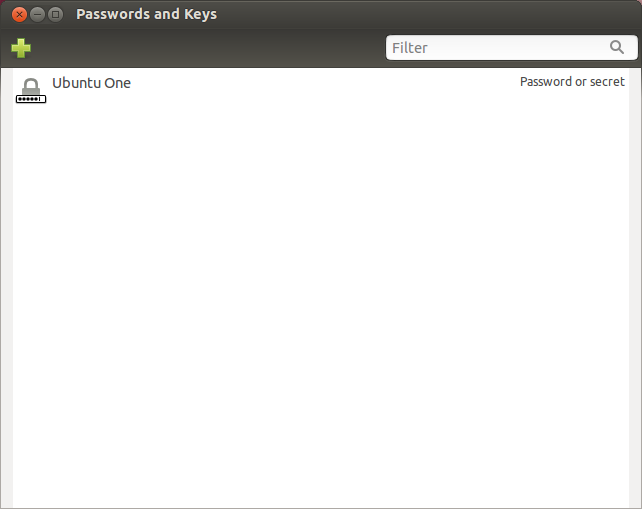 In the default Unity session, you can start the application by clicking on the Ubuntu launcher (the first item) in the Unity launcher bar on the left side, then typing Password, and selecting Password and Encryption Keys from the search result. Leave this blank, choose "Continue", and choose it again to confirm you desire to continue without a password. The method is similar to previous Ubuntu versions, but I also include a command-live alternative at the end. 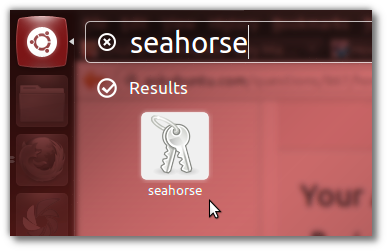 Alternately, open a terminal with Ctrl+F2+T, type seahorse & and press Enter. Close the keyring manager. After you log out/reboot, you won't be asked for your password any more. As an alternative to all the above steps, simply open a terminal, and type/paste the below, changing MYPASSWORD to whatever your current password is; that's it! python -c "import gnomekeyring;gnomekeyring.change_password_sync('login', 'MYPASSWORD', '');"
Simply delete your default keyring. (Backup the passwords first!) You don't need it. You can keep all your keys in the login keyring. The login keyring is unlocked when you login. All keys in it will be available, you don't have to enter more passwords again. If you are using auto-login, then when you want to access something that needs a key from the login keyring you will be prompted for the password, of course, but only once. You need to get the password for your login key ring to be the same as your normal login password. Click on the + and you should see a list of accounts that require passwords such as you Gwibber details, Evolution passwords etc. This means when you log in all of these accounts will be unlocked by this login keyring. 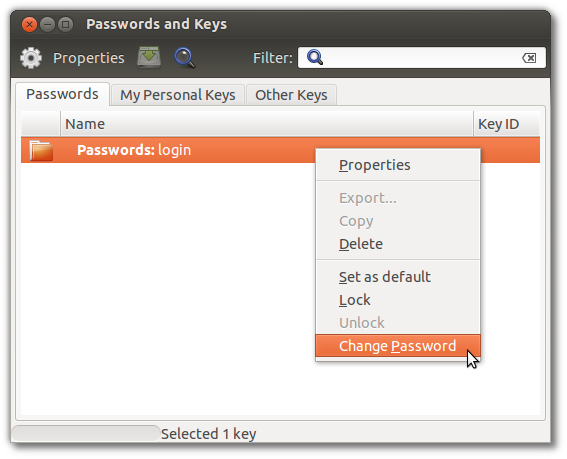 To get the keyring to unlock when you log into Ubuntu, right click on "Passwords: login" and choose "Change Password"
You will then need to enter your current keyring password and set your new keyring password to be the same as your normal login password. To test: Log out, log back in and open Evolution to prove that this has worked. Use this if you have forgotten the old password and is ok to delete items in the old keyring, but want to safeguard new keyring with matching password. For Ubuntu 14.04, I used the following. Enter your current password as the "Old Password"
Confirm to "Use Unsafe Storage"
Click View -> "By keyring"
Now just a matter of running our newly created Shortcut which launches Chrome without any interruptions! And then reboot your computer to see the effect. Then you need to enter your current password (old password). Don't enter any password for your new one, or leave it blank. You need to confirm that you will store unencrypted password. If you are sure that it is what you want, then just click "Use Unsafe Storage" button. Not the answer you're looking for? Browse other questions tagged keyrings seahorse or ask your own question. What is “Unlock keyring” and how do I get rid of it? How to disable password prompt for default keyring? How to remove sign-in (password) fields when i boot up? How to auto-unlock Keyring Manager? How to auto-unlock Keyring Manager in 12.10? 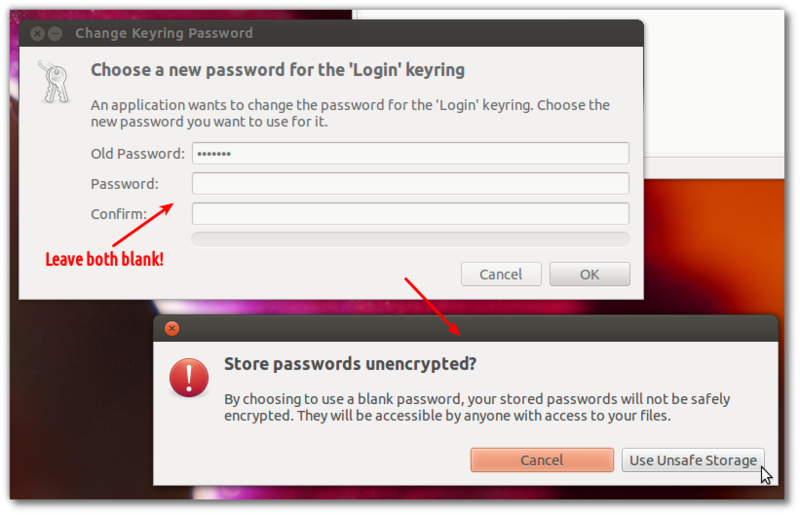 How do I turn off the keyring in ubuntu? 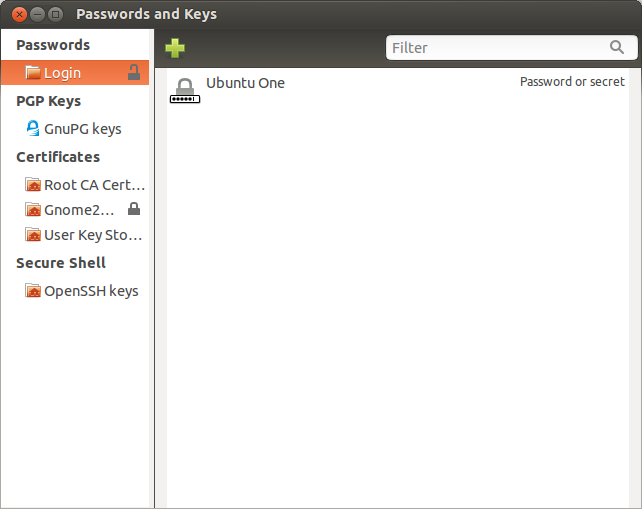 How can I get “Unlock private key” dialog (gui) with more than only insert password in Xubuntu?